Last week I wrote about the signs of chronic renal disease in cats. 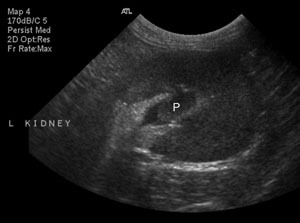 Ultrasound often shows small kidneys that may be irregular, have poor corticomedullary distinction, mineralization or pyelectasia. We see these changes commonly in cats with no or minimal clinical or biochemical signs of renal disease, and they stay quite stable. But acute decompensations occur, causing rising BUN and creatinine, and ultrasound often plays a large part in finding out why. Renal disease often affects both kidneys, but can be asymmetric. Cats with chronic renal disease can have one kidney that is larger than the other, that contains more normal looking parenchyma. If one kidney is failing, the other undergoes compensatory hypertrophy to make up some of the lost function. In general, this is the kidney that is performing most of the work. But both kidneys are affected by the same changes, and renal calculi are one of the more common symptoms. These calculi can dislodge from the renal pelvis and obstruct the ureter anywhere along its length. To diagnose this problem, start by checking the renal pelvis. Pyelectasia, or dilation of the renal pelvis, can be a sign of ureteral obstruction. The renal diverticuli look very distended (the shape of fingers), and the renal papilla looks blunted instead of v-shaped (image 1). You should be able to follow the ureter from the renal pelvis through the retroperitoneal space to the point of obstruction (image 2). It’s still very small, so slow and careful movements are the key to keeping the ureter in view. A high frequency transducer (10-12 MHz) is also helpful in getting the best image. Don’t forget to adjust depth and focal zones. 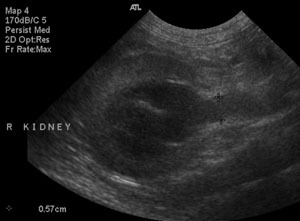 A ureteral calculus will look like soft tissue or mineral opacity within the ureteral lumen. Sometimes they will shadow (image 2), and sometimes they are too small to cause one. The ureter should go back to normal size (ie not visible) distal to a single calculus. The inflammation can also sometimes cause a hyperechoic halo in the retroperitoneal fat around the kidney(s). This is a subtle finding, so be on the lookout for it (image 1). You may also find pyelectasia and ureteral calculi in the other kidney. 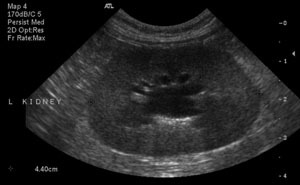 Most often, the smaller obstructed kidney is chronically obstructed, with a greater degree of pyelectasia, or even hydronephrosis. I find that the larger kidney tends to be the acute problem since it has been performing most of the renal function, unless it is larger because of hydronephrosis. The other acute exacerbation of chronic renal disease to be on the lookout for is pyelonephritis. Cats with calculi or chronic cystitis can develop pyelonephritis that causes decompensation. Again, you are likely to see changes in both kidneys that indicate chronic renal disease. One of the major features of pyelonephritis is pyelectasia. The renal pelvis is dilated, but not to the degree as an obstructed kidney. The renal diverticuli tend to look more pointed than rounded, and the papilla is blunted (image 2). The ureter is usually not traceable past the first few centimeters, though it may be distended all the way to the bladder. You may see some sludge in the renal pelvis or ureter without obstructive calculi (image 3). The hyperechoic halo can also be a sign of pyelonephritis (image 2 and 3). Kidneys with pyelonephritis also tend to enlarge because of inflammation. This can be hard to tell with kidneys that are already altered in size, but you can compare them to previous measurements if they are available. Hyperechoic or hypoechoic foci in the cortex or medulla can also be a sign of infection. Pyelonephritis can be either unilateral or bilateral. 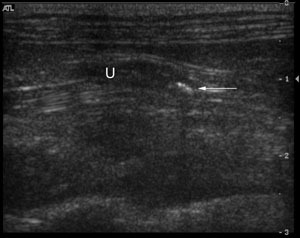 There are other causes of acute renal decompensation in these cats, but the two listed here are most common, and have the most consistent ultrasonographic signs. Be patient when looking for the signs, and when trying to trace the ureters, to get the most from the ultrasound exam. Some of the signs are common to both diseases and they can be difficult to differentiate. 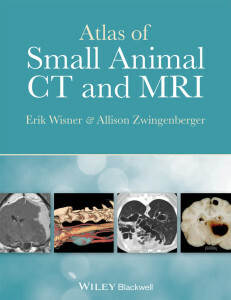 Other imaging options to diagnose ureteral obstruction include an excretory urogram, nephropyelogram, and CT scan.